Ghost Archipelago Campaign ’18, Game 5: The Abandoned Watchtowers | H.A.W.K.S. Chris Palmer This past weekend we got together for the fifth game in our Ghost Archipelago campaign. We had only 5 of our regular 8 players. 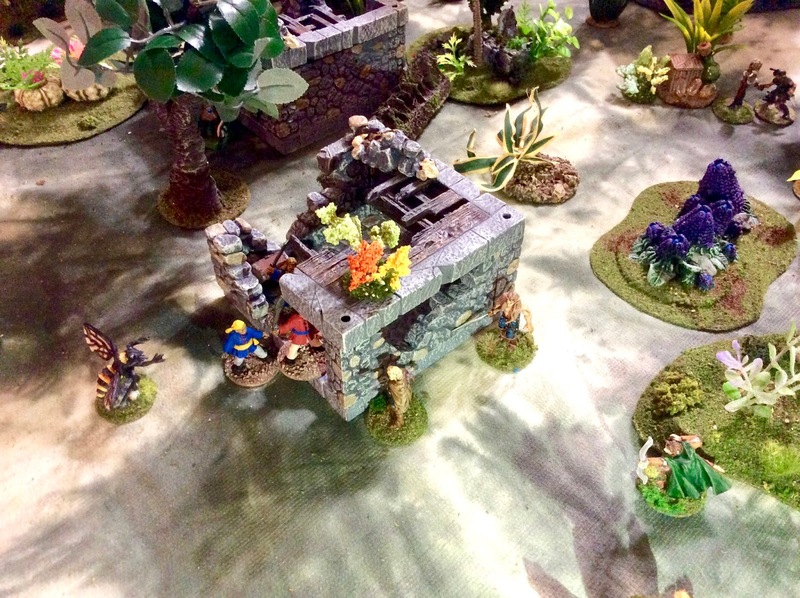 We continued to work on the scenarios in the rulebook, moving on to the third one: The Abandoned Watchtower. We used a 6’x3’ table and had two watchtowers with their Central Treasures on top. 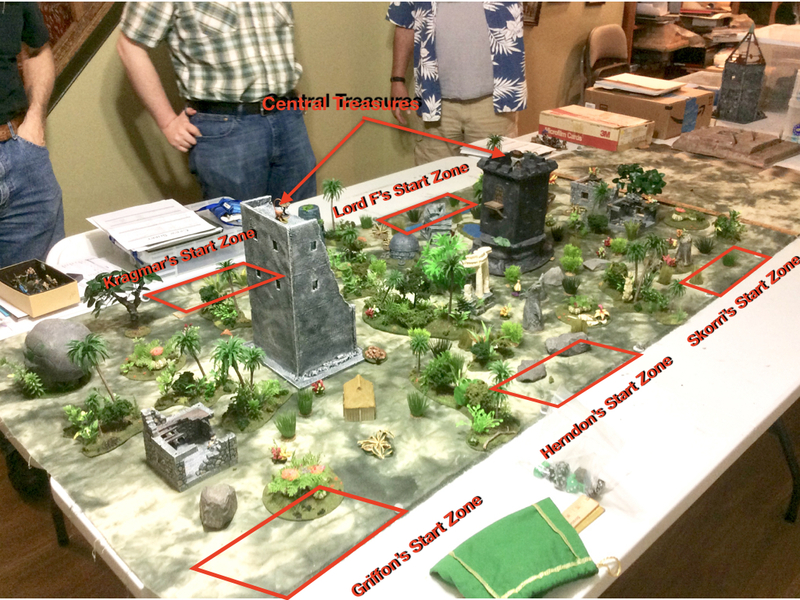 With the odd number of players, we had to carefully place the watch towers so they were placed within equidistance of both the players on the two-player side of the table and the three player side of the table, so they were a little off from the centerline. A look at the table before crews were deployed. Unfortunately, Skorri Drakenburg and his Beast Warden, Agger, set up directly across from me. I didn’t look forward to a repeat of last month’s debacle. Kragmar of the True Blood, and his Storm Warden, Samael Gale set up to my right, and diagonally to my front right was the Heritor, Herndon, and his Wave Warden, Arwhine. I was lucky with my chip draw for starting location, getting first choice. I picked one of the corners, down by the dark grey tower (as seen in the picture above), as there seemed to be a good chance at getting at least a couple treasures there; including one that was easily within a single move away. There were two in a pair of low ruins to the left of the tower, another in a patch of jungle between the ruins and the tower, and a fourth atop a rocky outcropping to my front right of the tower. And, of course there was the central treasure on top of the tower. It had all started last month when they had set off to explore an island of shipwrecks. There, the Heritor had suffered a grievous wound at the hands of the Heritor, Molly Malone. His life had hung in the balance, and the direness of his situation had brought about a trip back to the mainland for a healing potion to set him on the road to recovery, as well as the important replacement of their late Hunter and Archer. Lord Fortrywn never should have entrusted his Niece and Warden, Marnilyne, to purchase a dockside potion by herself; but then again, with his trusted Hunter, Gwynwater, gone (one of the casualties of the shipwreck island), who could he trust anymore. His reaction to some ingredient in the potion had been horrendous; vomiting, headache, chills… All ailments seldom suffered by Elves; and he had had to suffer through the indignity of them all. The Heritor had been rendered bedridden for two weeks. Yes, the wound had healed in a surprising short amount of time, but the side effects of the draught had almost been worse. His Niece, Marny, had spent the long weeks of his convalescence teaching herself how to manipulate vines into all sort of intricate knots, loops, and patterns. A charming novelty spell; who knew if it would ever prove useful. (Learned Ladder upon reaching level 4). Lord Fortrywn deploys his forces. On the left Marniyne the Warden, Randilas the Archer, Salin the Pearl Diver, and Crewman Vilkse. On the right, Lord F himself, Bindidell the Hunter, Tannin the Archer, and Crew-woman Arbyn. In the center is Crew members Meriwyn and Dirkand. As the side effects passed, Lord Fortrywn had felt well enough after a few weeks to lead an expedition to investigate a pair of old watchtowers they spotted along the coast of a small island. They looked like proper stone military structures, not some tribal building, so the old Elf general hoped there might be maps or navigational charts in them that could aid in their quest for the Crystal Pool. He ordered a landing party be gathered and they set off to investigate. In retrospect, he thought, he may still have not felt well enough to have been quite up to the task; his head had still ached and he had not been sleeping well. But, as they say, after you have met your failure face to face, you can see the path on which it arrived with the eye of a a hawk. Everything had started out well enough. They landed at first light, and made their way the short distance inland to one of the towers. Lord Fortrywn divided his crew into three groups. With himself he took the new Hunter, Bindidell Gladeshadow; the new Archer, Tannin Softsing, and the dependable Crew-woman, Arbyn. He assigned to his Niece, Marny; the Archer, Randilas; Salin, the Pearl Diver, and the Crewman, Vilkse. Crew members Meriwyn and Dirkand were left to fill in where needed. He instructed his Niece and Warden, to get her group started on the path towards some small outbuildings on the left, then return quickly to assist him on the tower with the new vine intertwining spell, Ladder, that she had learned. Lord Fortrywn with his group, made his way to the right, towards the ruined tower. 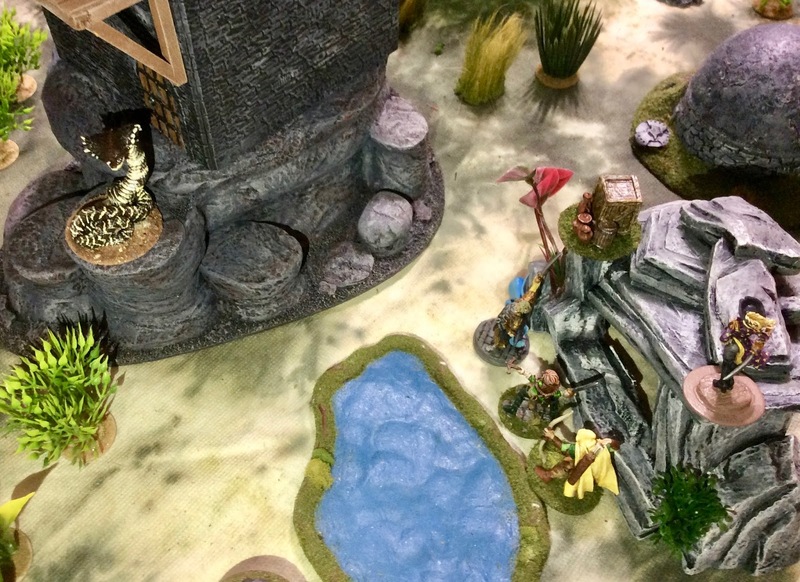 As they neared, and circled around a small pond, they spotted a Large Snake curled up and sunning itself on the warm rocks at the base of the structure. The new Hunter, Bindidell, fired at the big reptile, but missed. Then the new Archer, Tannin, also shot, but had better luck; his arrow piecing the beast at the base of the head, killing it instantly. The group continued forward, and when they were almost at the base of the rocky outcropping on which the tower sat, Arbyn split off to the right to investigate some old crates and jars she spotted nestled in a crevice in a secondary smaller outcropping nearby. Lord Fortrywn, Bindidell, and Tannin head for the tower, as Arbyn investigates a cache of crates and jugs on a small outcropping. The two crew, Meri and Dirkand, made their way up the middle keeping equidistance between the two groups, they spotted some crates and jugs nestled in some undergrowth, and moved to investigate. As they did so a pair of arrows whizzed by Meri’s head from a pair of Skorri’s Archers who approached in the distance. Figuring they didn’t have a lot of time to investigate, Meriwyn grabbed the largest crate and turned to run for cover. Dirkand bravely put himself between his fellow crew member and the Archers firing upon them. Nonetheless, and sharp point sliced through the Crew-woman’s shirt cutting a long gash across her arm (-2 HP), and another again whizzed past her head. It had started to grow darker on the island, as thick clouds began to over the sun. (Kragmar’s Warden had cast Cloud Cover.) Back at the watchtower, Lord Fortrywn and Bindidell had reached the base of the large outcropping upon which it sat, and began to climb. The Elf Lord could now see Skorri Drakenburg’s crew further away in the jungle. They seemed to be mostly concentrated around a pair of ruined huts a fair distance away in the direction his Niece and her party had set off. In the back of his mind a concern began to grow as he realized there didn’t seem to be anyone else heading for the tower. Nearby, with the Archer, Tannin covering her, Arbyn recovered a treasure chest from the rocky crevise, and the pair began to make their way back towards safety. 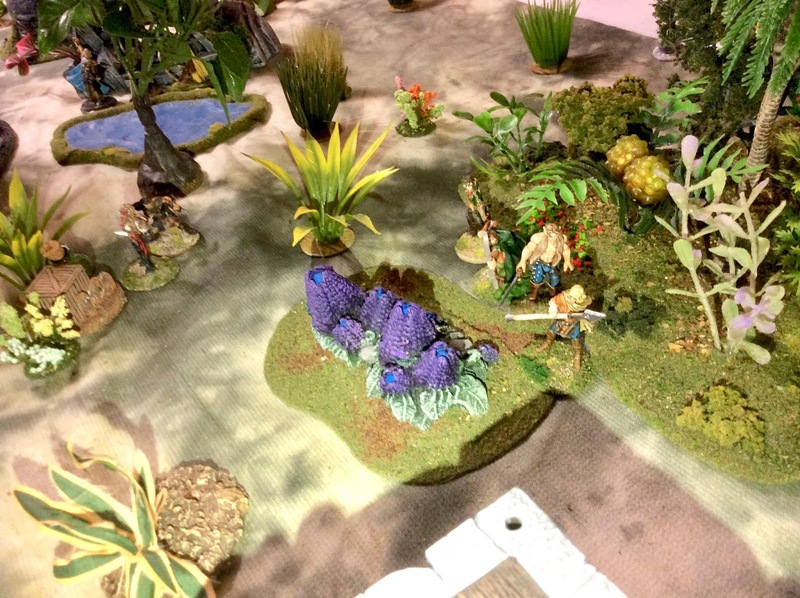 Meriwyn leads her group to the left, around a large patch of jungle , heading for the pair of ruined huts. Over by the huts, Marny and her fellows had stumbled right into Skorri himself, his Hunter, and a fair number of his crew. 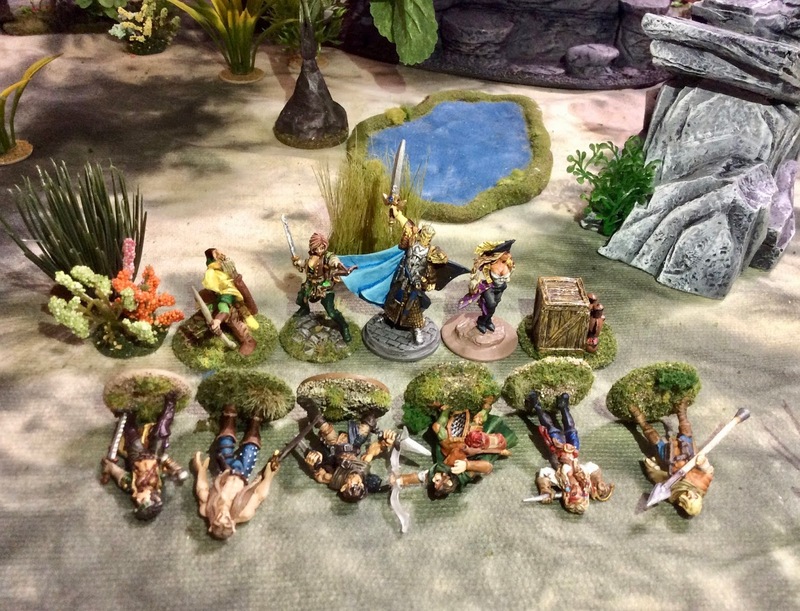 The Elves found themselves severely outnumbered. Quickly, Marny chanted the Bramble spell to block some of them from advancing any further, as an arrow from Skorri’s Hunter struck Vilkse the crewman in the shoulder (-4 HP). Pulling the shaft from the wound, Vilkse continued forward attempting to take cover behind the wall of one of the huts, he was joined by Salin, the Pearl Diver. They then heard the dreaded loud hum of a Giant Wasp, and the creature came flying through the jungle and appeared a short distance from the huts (Summoned by Skorri’s Warden, Agger.) Marny’s mind raced. She knew she had to make a stand here, or Skorri’s whole crew would be able to sweep around behind them. The girl had no tactical training and tried frantically to devise a plan. Then the first arrow hit her, fired by Skorri himself. It hit her hard in the side just below her ribs, and spun her around (Reduced to 2 HP). She fought against the pain, and tried to remain conscious. Then the second arrow hit her in the back, just above her waist, his one from Skorri’s Hunter, and pitched her forward into the tall grass, where she lay unmoving. The Wasp made a direct line for Randilas the Archer. As it maneuvered to attack, the brave bowman sliced hard with his dagger cutting off part of one of the insect’s legs (-1 HP). It reeled back giving Randy enough time to bring his bow around, and he fired, but missed. Shouldering his bow again, he drew his dagger and charged the Wasp. Vilkse joined him with his spear. Distracted by this new threat, the Wasp turned from the Archer and in a flash grabbed the unfortunate Crewman with two of it’s good legs, and swinging it’s body forward thrust it’s long saber like stinger into Vilkse, before he even knew what hit him. The Elf crumpled to the ground, a gaping wound in his chest. Salin now came up to join the fight, and swung wildly at the insect, his sword hitting, but not cutting into the beast’s chitinous body. As the Beast turned to face this new threat, Randy saw his chance, and plunged his dagger into the Wasp’s side. The creature spasmed, and dropped to the ground; it’s wings fluttered weakly a couple times and then it was dead. With the beast dead, and realizing Vilkse and Marny were both out of action, Randy and Salin quickly ran for the cover of the nearby jungle patch before any other enemies could assail them. 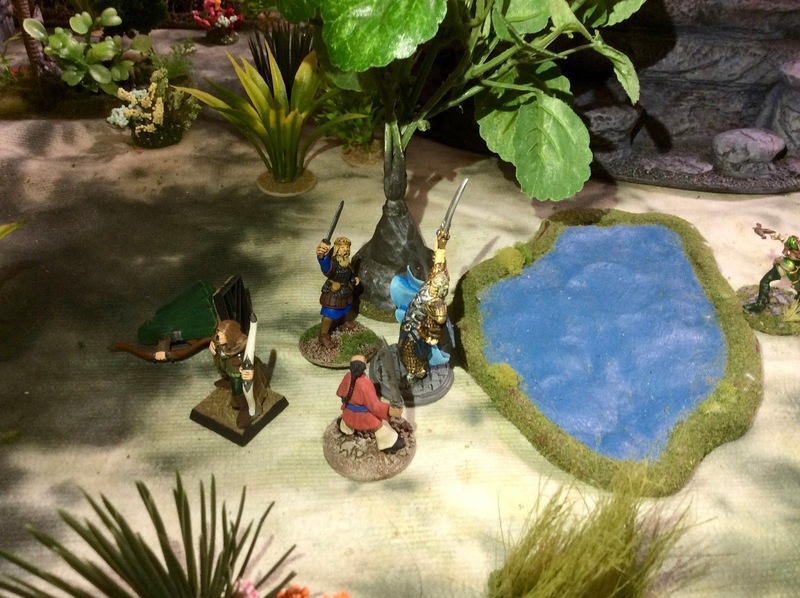 Vilkse and Salin try to take cover by the hut’s wall, as Randilas notices the Giant Wasp making a beeline for him. Fifty yards away, Meri continued to haul her heavy crate back towards safety, with Drikand covering her rear. Two more arrows sliced the thick air around them as the Archers drew ever closer. The first flew past harmlessly, but the second struck the Crew-woman in the thigh. Meri cursed, and pausing just a moment, pulled the shaft from her leg. (-3 HP) Stoically, the Elf continued to haul her heavy crate back towards safety, as two more arrows whizzed by. Over at the tower, Lord Fortrywn and Bindidiell had reached the base of the structure itself, and had began to scale the wall, when the Heritor had second thoughts. From his perch, he tried to see what was going on in the jungle beyond, but the overcast gloom made seeing anything beyond the base of the outcropping impossible. Marny should have been there by now. Where was that girl? And where was Skorri or any of his crew? Something wasn’t right. He realized he had been out maneuvered, and that cursed Human, Skorri Drakenburg, was waiting for him to go to the effort of retrieving any treasure from the tower, so he could simply take it when Lord Fortrywn returned to the ground. Meanwhile, he was probably cutting his way through the rest of the Elf Lord’s crew. “Halt!” he ordered the Hunter, and she froze in place on the stone wall. “We are heading back down.”. Bindidell took the commnd in stride, and along with her employer, began to climb back down to the ground. Meri and Dirkand trying to make their getaway with the treasure. Meriwyn and Dirkand were almost to the cover of the jungle now, The Crew-woman looked at her fellow crew member and smiled despite her pair of wounds, they were going to make it. Dirkand smiled back, then his face turned to one of shock as he was suddenly hit by an Arrow from the Human Heritor. 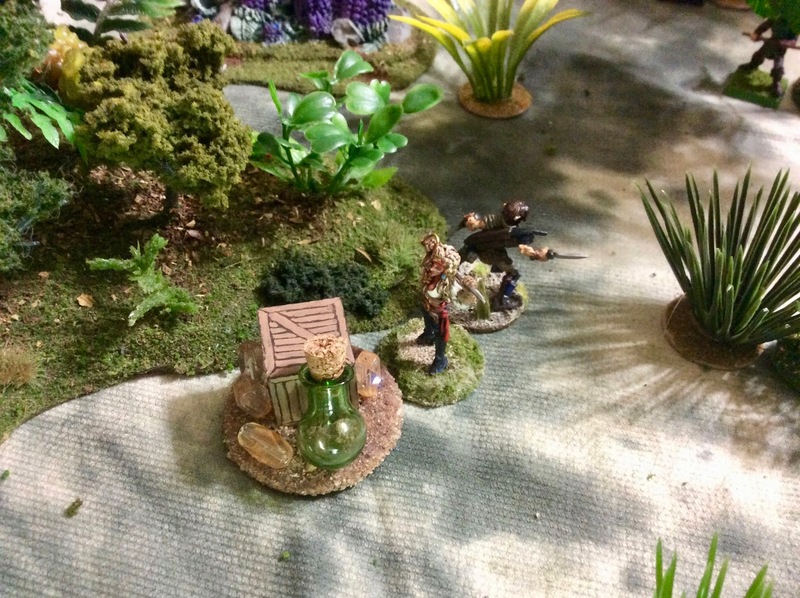 The Elf Crewman pitched forward into the undergrowth at the edge of the jungle patch. As Meri reeled from the shock of seeing Dirkand fall, there was a crashing in the jungle behind her, and quickly she turned to face this new threat. 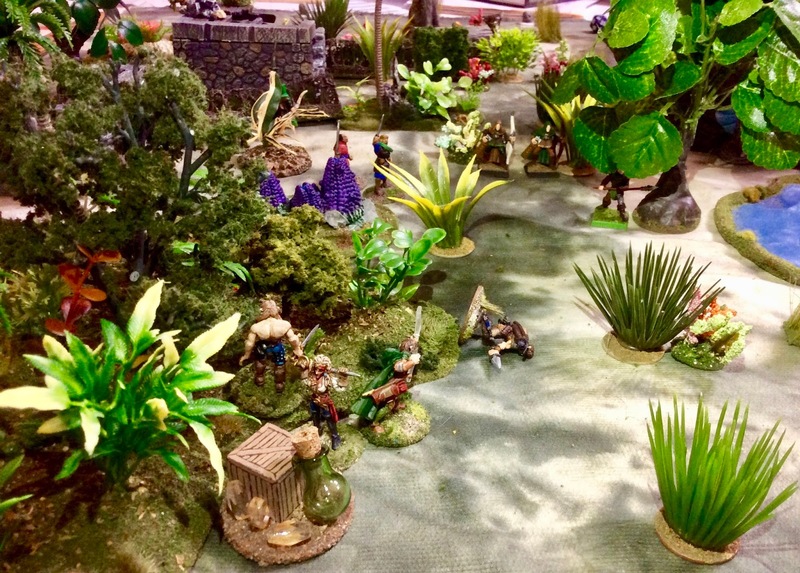 As Elf-woman drew her sword, Randilas the Archer, came bursting through a broad-leafed bush at the jungle’s edge. Meri gave a sign of relief and sheathed her sword, as the Pearl Diver, Salin, came slashing through the vegetation behind Randy. She was so glad to have some help as the forces of the enemy were closing in. As Meri meets up with Salin and Randilas, the forces of the enemy tighten the noose around them. Lord Fortrywn, reached the bottom of the outcropping, his feet touching the grassy ground. Bindidell however, had spotted the pair of Archers plaguing Meriwyn, and, firing her bow, wounded one. The Heritor turned to the Hunter, and with an urgent hushed command, called to her, “Get down here!” As he did so, an Arrow from Skorri’s Hunter whizzed past him. The nearby enemy Archers were still focused on their original target. They had see the new Elves appear with Meriwyn at the very limits of their sight. They fired again; the first arrow, hitting Meri for a third time, and finally brought her down, along with the crate she was carrying. The second arrow, found Randilas, striking him square in the chest. He was dead before he hit the ground. Salin suddenly found himself alone with the treasure. Lord Fortrywn had had enough and drawing his sword he charged at the closest of Skorri’s Archers, who had already been wounded by his Hunter. His sword came down, and the man brought his bow up as a quick defense. The Heritor’s sword sliced the bow in two, and sent the man staggering backward, but failed to hit the target itself. (Lord Fortrywn wins the Fight roll but does no damage.) Bindidell raced after her Heritor, and then paused a moment to raise her bow and fire an arrow, hitting the man as he staggered backwards, killing him. Skorri himself now charged towards Lord Fortrywn, and was upon him before he could reposition after his strike against the Archer. One of the Human Heritor’s Crewmen also ran up to support his master. Skorri swung powerfully, and Lord Fortrywn tried his best to block, but failed. The Human’s blade cleaved the Elf’s chest plate and cut a mighty gash. (Lord Frotrywn reduced to 6 HP). The enemy Heritor attempted to finish him with a Backswing, but was too unbalanced himself from his rushed attack, and failed. As Lord Fortrywn prepared for another attack, he suddenly felt a burning sensation all over his body, that wasn’t the Blood Burn he was all too familiar with. The Heritor was then suddenly overcome with intense nausea. Involuntarily, he bent forward, and heaved the content of his stomach onto the jungle floor. He looked up at the Human in shocked realization: the enemy’s blade had been Envenomed: Lord Fortrywn was poisoned. He staggered, and fought to keep upright. Skorri merely laughed at him, and hearing a call from his Hunter, turned his back on the Elf Lord, and jogged away. As Skorri and Lord Fortrywn had fought, the Human’s Hunter, had charged at Salin, the Pearl Diver in an attempt to relieve him of his treasure. The Hunter called for assistance and Skorri ran to help, knowing Lord Fortrywn was no longer a threat, and there was treasure to be had. The Human Heritor ran up, and Surging ,swung his blade wildly at Salin, strking him on the side of the head with the flat of the blade. For a second the Pearl Diver saw stars and then collapsed into the brush. Helplessly, his mind clouded with the poison, Lord Fortrywn hurled insults at the Human Heritor, challenging him to come back and finish the fight. 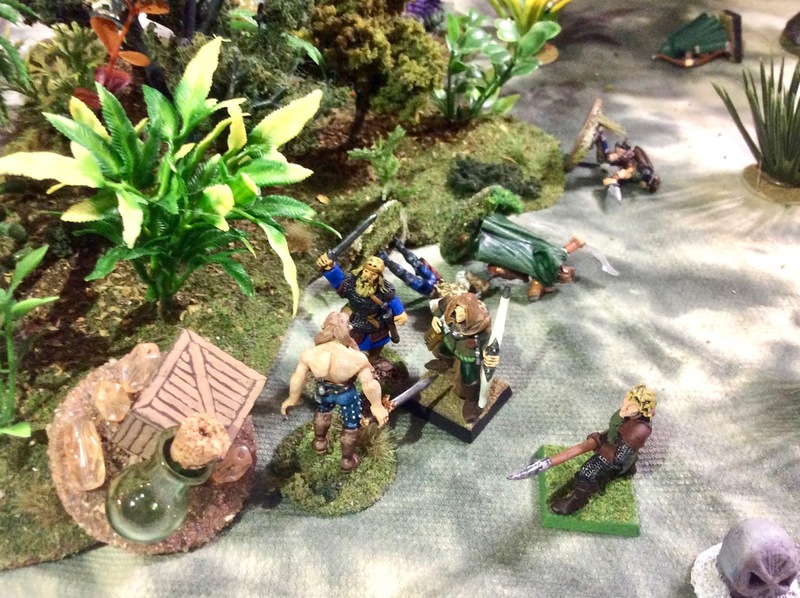 Skorri ignored the Elf Lord, and had his Hunter scoop up the treasure, and they melted away into the jungle. 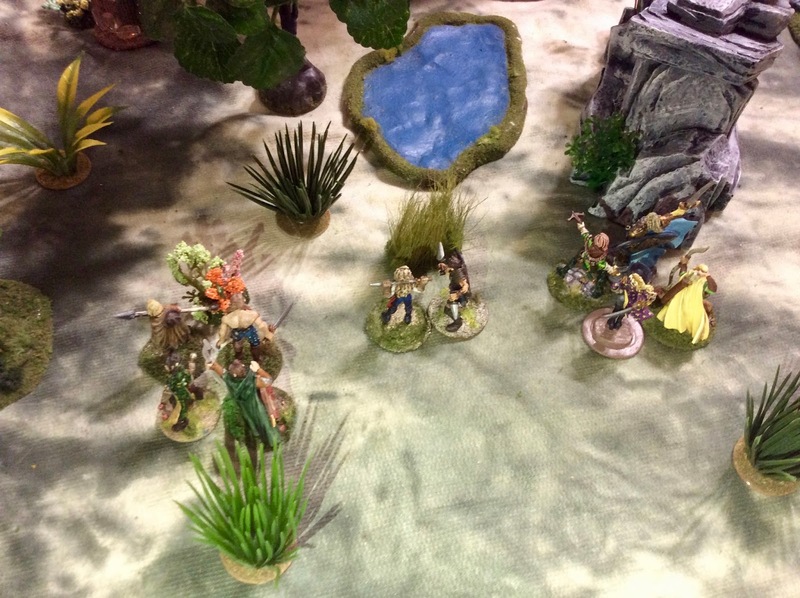 Salin is overwhelmed by Skorri and his Hunter, as the enemy’s Pearl Diver stands in support. As the sun set that night, Lord Fortrywn lay in his bed aboard the Silver Sword, bathed in a cold sweat, and passing in and out of consciousness from the effects of the poison. In his more lucid moments, he pondered how the past 6 weeks had been a disastrous series of events, the end result being him laying here in a poison induced fever. On this expedition alone, he had lost both Randilas the Archer, and the Crewman Vilkse. Salin, the Pearl Diver, was severely concussed from the Heritor Skorri’s mighty blow, and would be confined to bed for a long time. At least his Niece was safe, despite the wounds she received. Their reward, from the one small chest Arbyn had been able to recover, was a mere 40 Gold Coins. (I rolled a 3 on the treasure table. 😦 ) He began to wonder if he was cut out for the life of seafaring adventurer. He needed the Gods to favor him soon, or his trip the Archipelago would be a very short one. Five months and only one Map Stone to show for it. Hardly the results he had expected. But he was smart enough to know not to make any decisions in his current state. He needed rest, he thought,…he needed rest…he needed…and slowly he once more drifted off into a fitful fevered sleep. The fallen, and those who walked off the field. Of course, it also didn’t help that I couldn’t roll to save myself at all the entire game. Luckily, Kragmar and I had an informal truce for most of the game, brought about mainly by the simple fact that our start zones were rather far apart. I now find myself in the interesting situation that since my Heritor hasn’t been getting treasures, or killing hardly anybody, but my Warden has been casting spells consistently each game, that she is almost equal in Experience points with my Heritor. In fact, if she hadn’t been taken out on the second turn this game, she would have surpassed her Uncle! As always, I can do nothing but set my eye on the next game. I think I am going to have to just keep my entire 10 member party together in one big group, to be better able to face whatever comes my way.